New eastern Libya 1 dinar Coin !! Can anybody read what the script says? Since the Libyan coins dated 2014 came out I've been suspecting that they were also minted by the Russian Goznak, but I've been unable to find confirmation. The Goznak boasts about their recent large minting deals with Angola and Colombia but they don't mention Libyan coins at all. E-mails are naturally never answered. This obviously doesn't prove anything about the origins of the 2014 coins, but their style and general appearance look very similar to the new dinar. 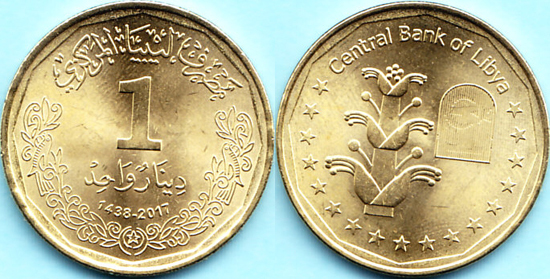 Design element 2 is described as silphium, so it fits exactly into the 50, 100 dirhams, ¼, ½, 1 dinar coin series that was announced and described by the Central Bank of Libya four years ago. Source: Schön's World Coin Catalogue 46th edition 2018. A plant. Thank you, Gerhard. They already have banknotes printed by Russia, so it won't be surprising if the coins are also struck by Russia. The coins have been struck in Russia. Here is the confirmation.